One of our favorite coffee shops has closed. We just learned that Whynot Coffee has been closed for about a week now — as Bowery Boogie reported “movers were busy clearing out the enormous ground level space at 175 Orchard. It’s done” on November 13th. 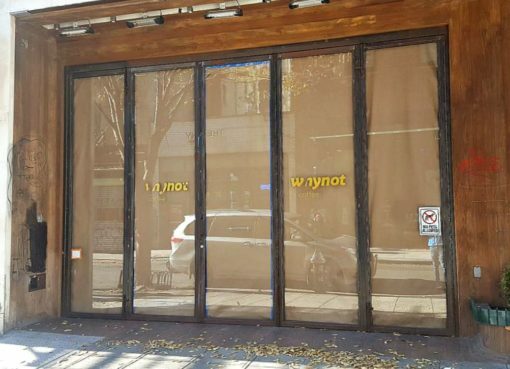 When we walked by today, there was brown paper covering the long windows with one of the Whynot stencils partially scratched off. It’s hard to believe that this 4-year old coffee joint is closed seeing as the cafe was almost always packed. There aren’t many cafes that had that unique combination of great coffee, atmosphere (homey yet cool), plentiful seating, free wi-fi, and plenty of outlets. Whynot could fit dozens of patrons and was still somewhat open and airy. What was most impressive to me, and a feature I hope other cafes took note of, was how they formatted their seating. The cafe was lined with small circle tables along both walls. Those tables, at first glance, looked like they were too close together, but when seated was the perfect amount of space for solo work or sharing a coffee with a friend. We loved Whynot and we’ll miss the thoughtful cafe. Though Whynot will be missed significantly by me, the cafe’s demise makes room for a Una Pizza Napoletana’s hyped-return to New York City.